It turns out there's a lot more choices then you'd think when putting together something made solely of dirt. - How wet does the dirt have to be to make the walls? Too dry and it will crumble, too wet and it won't hold its shape. - Exactly what shape should the wall be? Straight up and down or sloped walls? - Do you dig out the recessed areas or just build up the walls around it? Or a little of both? 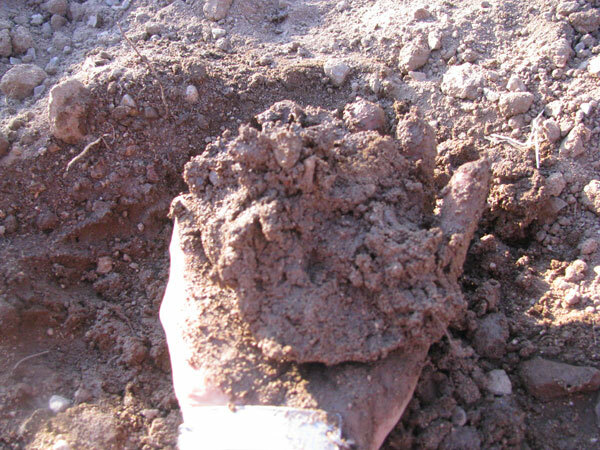 - Do you get dirt from other areas and add it, or scrape soil from the same spot? - How long do you let it set? How hard should the dirt be? Do you add mulch or not? Who knew it would take so much fiddling? Well...probably anyone who's done anything by hand while going off of a bit of internet information, that's who. There's always those little details that people leave out, yeah? I decided on some of this fairly quickly. 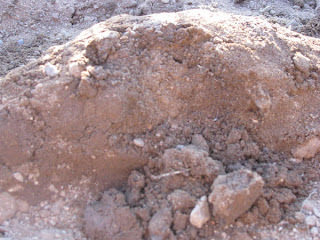 - I am going to dig in my garden squares part way into the dirt, and build up the walls a little above ground level. - I am going to use a little of the dirt that I dug up to prep the garden, plus dirt from the garden in general, to make the walls. After I make the waffle garden squares, I plan to mix some of my finished compost with some of the sifted dirt (from eliminating the gravel), plus some aged rabbit manure that I've collected from an area where I know rabbits hang out (Yes, I actually do this). 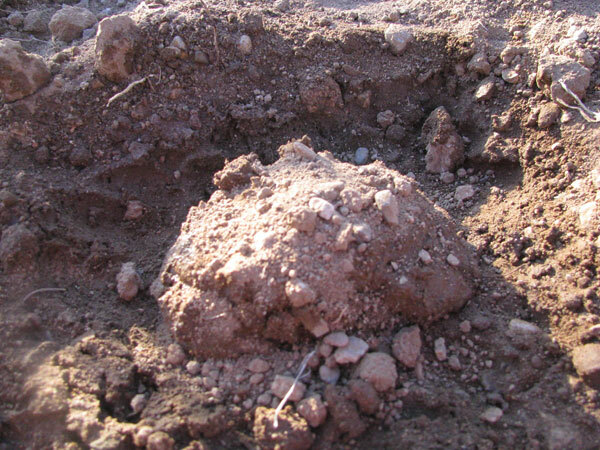 I'll add this to the inside of the squares to enrich the soil. - I plan to build the squares on one day, let them set overnight, and plant seeds the next day. Since I homeschool the kids, I can't spend all day gardening, so I'll be working on the gardening in between lessons. I imagine I can get 2-4 squares done a day, so the planting will be staggered a bit. - I have no idea how much water to add to the squares during watering. Fill them up to the top? Fill them half-way? One quarter? No idea. I feel like filling the squares to the top would be overkill, to be honest. Even half-way feels like too much, so I'm likely going to start filling up the squares with about 1/2 -1 inch with water. I can no longer remember which website I saw this on, but I recall a recommendation for watering daily for the first week, every other day for the second week, and then you're on 2-3 times a week schedule for watering. I'd like to try that for this first time out. With all that decided, there is one last thing to figure out, how wet the soil has to be. Well, with the miracle of internet delayed posting, I've now put in a couple of squares and I can tell you flat out: this took some experimentation. And lots of time. 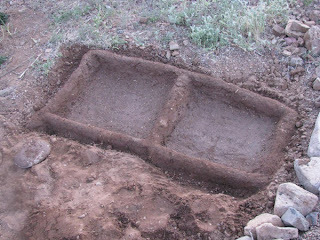 From the Waffle Garden Project, I got a lot of details on how Lorrain Loncasion, a lovely sounding Zuni woman whose family has worked with this type of garden for three generations now, created and worked with her own waffle garden just off of the Zuni river. Lorrain does not use any form of mulching, although I'm not sure if I'll try that as well, or if I might utilize a little home-grown mulch. And then it dried just a little and crumbled as soon as I touched it. Obviously, I had to get some wetter dirt. I made a little bowl of loose soil, added water to it, and made a ball of very wet mud. Then I mixed in dry dirt, a handful at a time, kneading it into the mud after each handful. 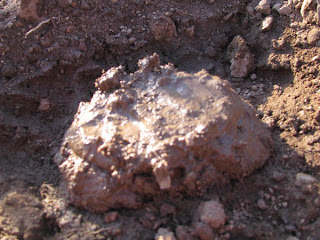 And finally I had a nice, moist ball of thick mud to work with. Murphy's Law being what it was, this turned out to be too wet. I made a lovely wall, no question, but it was so wet that when I started to press down on the wall to smooth out the top, it would sag and bulge instead of keeping it's form. To make a wall, I made a little mound of dirt and basically squished it until it resembled more of a rectangular mound of dirt than a circular one. It looks pretty much like the beginning wall looked in the picture above. 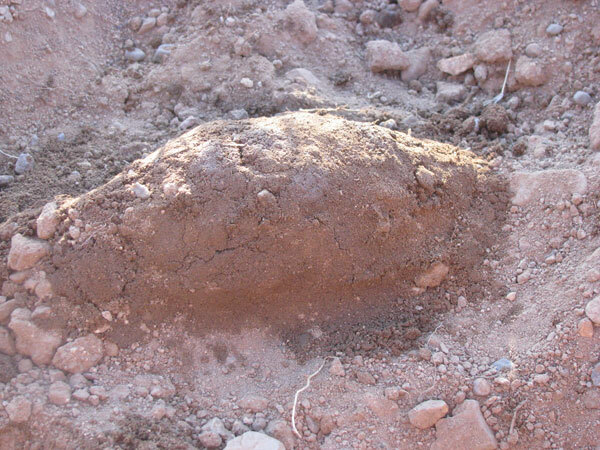 Then I continued making more mounds like this, connected in a line down the length of where my wall would be, patting it down as I went, making it thicker at the bottom than at the top. Then I added more dirt on top of one spot, patting it down again and building it up higher. I repeated this all the way down the wall, and then repeated it again and again until I had the wall as high as I wanted. It usually took me two to three repetitions before the wall was high enough, and I almost always misjudged how wide the wall should be and had to widen it to add more on top without making it too thin. As I was forming this, I tried to smooth out the uneven sections by either adding moist dirt for the large uneven sections, or I would add fine powdered dirt that I patted in if the uneven sections were small. To form the top of the wall and pat it down after I'd made it, I made a C-shape out of my hands and would press down repeatedly along the length of the wall, with the wall between the open space of the C. It worked pretty well, actually. My first two complete waffle sections! After doing this, I've been looking at some of the waffle gardens I find online and I have to chuckle. I am such a...I don't know what I'd call it. A just-do-it type of person. Or a lazy one. I saw waffle-garden projects where they measured out exactly where the walls would be, evenly measured, posts at the end to show where to make the walls. That is so not how I do things, not if I don't have to. And with a garden? Seriously, I don't feel like I have to. I could be wrong and may have to eat my words, but for now, I'm simply estimating where I want my walls, getting in the dirt with my hands, and totally enjoying make these suckers. No measuring used. Which is probably a good thing, considering that my son was so enthusiastic about this that the next day, he went out and started making more walls himself. Measuring would have fallen even more by the wayside, LOL. More on the Waffle Garden as it progresses! I would have thought that some work with a hoe in damp soil would have gotten the job done. But then I am without experience in this kind of gardening. Also, I am extremely reluctant to work on my knees, which would involve a considerable amount of pain.